Designed by Richard M. Upjohn, a cathedral architect, this High Victorian Gothic style statehouse was designated a Registered National Historic Landmark in 1971 and underwent a restoration between 1979 and 1989. The exterior marble from East Canaan, Connecticut and granite from Westerly, Rhode island is accented by a gold leaf dome. The interior floors of the Capitol are inlaid with white marble and red slate from Connecticut and colored marble from Italy. The stenciling, stained-glass windows and light fixtures were designed by Boston interior decorator William James McPherson. 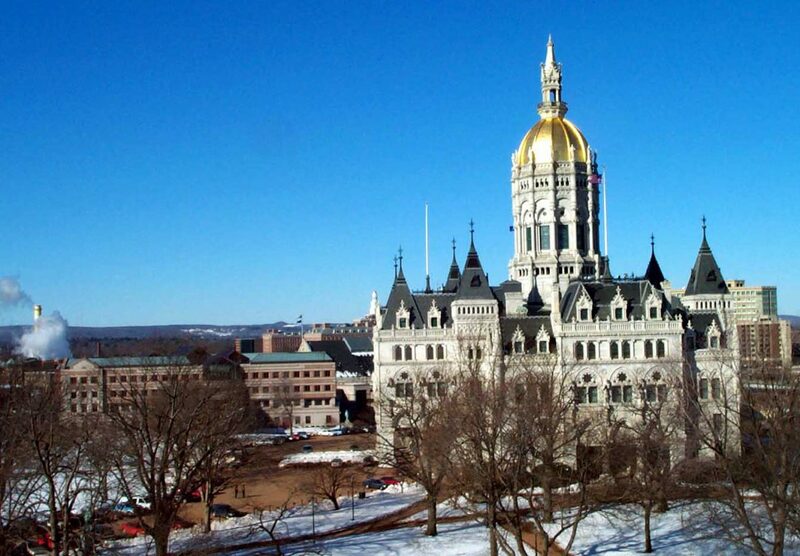 This beautiful and unique building houses the executive offices and legislative chambers of the state, as well as historical memorabilia including statues of Nathan Hale, “The Genius of Connecticut” and Governor William Buckingham.